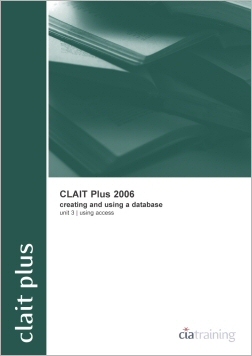 The 3rd guide in the CLAIT Plus 2006 series will teach you how to design, create and save a database, to add, amend and delete fields and records. You will learn how to import data and how to interrogate a database using complex criteria. Additionally, you will be able to create and format reports and to present data professionally. This product is available in 5 different versions. Click the Buy Now button at the top or bottom of the page to select the version you would like to add to your shopping cart.